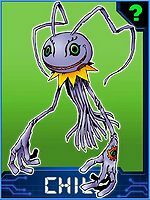 A Child Digimon that evolved from Tsumemon. 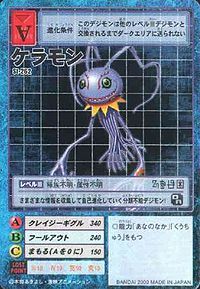 Its physique has gotten larger, and with its huge mouth, it can eat away at much more data than Tsumemon could. 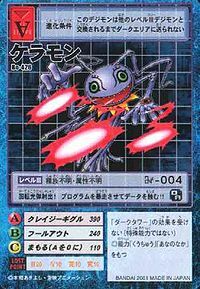 Because it eats away at more than 100 megabytes of data per second, the data is destroyed the instant it enters Keramon. 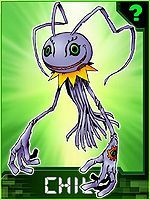 Due to its extremely cheerful personality, it thinks of its destructive actions as just part of its play. Its Special Move is spewing out an exceptionally destructive bullet of light while laughing (?) (Crazy Giggle). 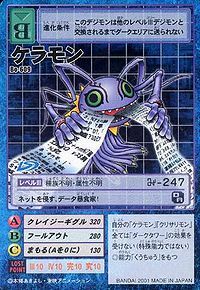 A Child Digimon that consumes massive amounts of data with its huge mouth. Its Special Move is Crazy Giggle. It shoots a exceptionally destructive bullet of light from its mouth. — Digimon Savers: "Yoshino gets her Cinderella Story?! Chrysalimon's Shadow"
From Kerakera 「ケラケラ~」, the sound of cackling laughter. 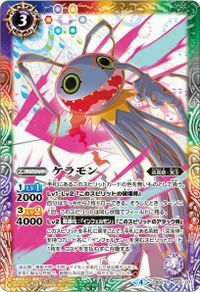 Crazy Giggle  クレイジーギグル Kureizī Giguru Bug Blaster/Crazy Giggle Fires a shot of exceptionally powerful bullet of light from its mouth. Attacks by extending its arms and spinning around. Hits an enemy with both hands. Fool Out  フールアウト Fūru Auto Network Flapping Emits an unbearable discord. 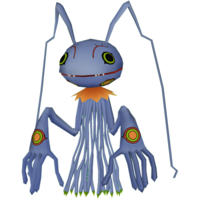 Keramon from Digimon Adventure: Our War Game. 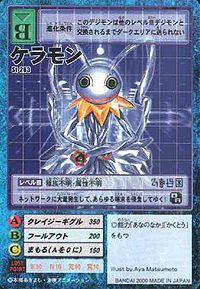 After eating enough data Tsumemon evolved into a Keramon. 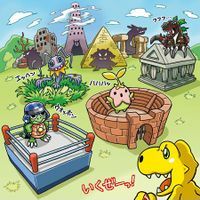 Agumon and Tentomon battled it a bit before it warp evolved into Infermon. Neon Hanamura, an old schoolfriend of Fujieda Yoshino, used a Keramon to broadcast his music videos over every channel for free publicity. Later on, Yoshino and Lalamon were attacked by Keramon. When a reporter catches this, Neon gets angry and Keramon evolves to Chrysalimon. 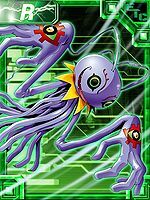 Can be evolved from Kuramon if above level 8 and Darkness EXP above 500. He can evolve to Chrysalimon if above level 19 and Darkness EXP above 1000. 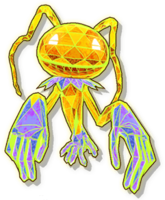 Can be evolved from Tsumemon if above level 18, Darkness EXP 450, and already befriended Keramon, or can be found at Magne Mine. Can evolve to Chrysalimon if above level 27, defense 110, and already befriended Keramon. 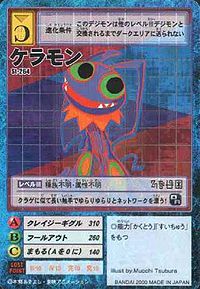 Keramon is only obtainable as a collectible card. 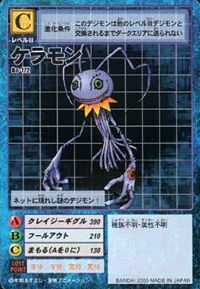 Its card is part of the The Wickedest Virus (最悪のウイルス Saiaku no Uirusu) set. 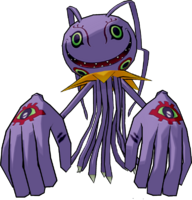 An unknown type of Digimon who can make itself evolve by collecting various data! 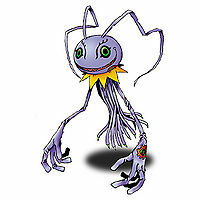 Many of these Digimon appear on the network and invade every computer terminal! It wanders around the network with its long jellyfish-like tentacles! 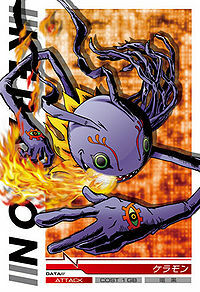 A mysterious Digimon that appeared on the Net! It fires revolving bullets of light! It causes programs to go haywire while it devours their data!! This data glutton invades the Net! It views the destruction of data to be the same as playing, and continues carrying it out innocently as it grows. It is capable of devouring over 100 megabytes of data per second, which destroys the computers that it invades. 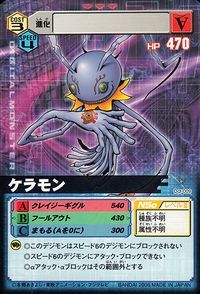 A Child Digimon that evolved from Tsumemon. Due to its extremely cheerful personality, it thinks of its destructive actions as just part of its play. This page was last modified on 15 April 2019, at 22:31.